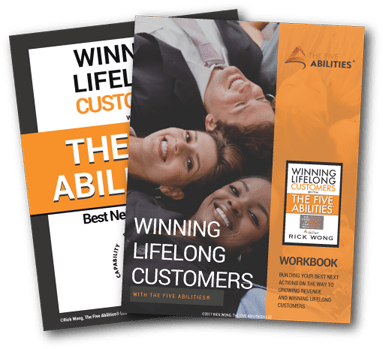 An important ability within The Five Abilities® is VISABILITY—the critical ABILITY in prospecting. Being seen in the right way, by the right people, at the right time. Often overlooked is the reality that this troika rarely happens all at once. Successful salespeople know how to sense when all components are not available. Three years ago, at a friend’s birthday party, I met a woman who had just changed jobs that week. She was the VP of Sales for a software and services company in the western United States. My friend introduced her as a “big-wig” at the new company. He introduced me as a sales consulting guru. The VP was friendly and yet I could tell she was uncomfortable talking about a job she’d been in for less than a week. About a minute into our discussion I said, “I’m giving you a card just in case I can help you in the future and then I think we should talk about how bald the birthday boy is?” (The birthday boy was standing right there.) The VP laughed and I could see her relax as the birthday boy exited. We carried on with multiple topics ranging from college for our kids to how mobile phones had hurt the abilities of our children to have simple, fun, conversations, like we were doing at that moment. By the time the party ended we had talked with each other’s spouse, she gave me her business card, and we hugged each other on the way out. Over the next three years I sent her a few articles that I thought would help in her new role. I sent her my book when it was finished. Last month, she texted me asking if I’d come to her office to discuss sales challenges. Next month I’m starting a consulting engagement with her company. That birthday party allowed me to be seen in the right way, with the right person. It just wasn’t the right time until last month. As Jeb Blount says in his bestselling book Fanatical Prospecting, we must prospect all the time and I fully agree. I’d add that in prospecting we’re accomplishing three things that might not all happen all at once. No matter where you are or what you’re doing have business cards at the ready along with a value proposition. The Five Abilities® defines a value proposition as a sub-30-second statement, that creates a “suspicion-of-value” in the mind of the prospect such that they ask to know more. This is the proverbial elevator pitch and your goal is to get the prospect to invite you off the elevator because you sparked their interest. Two things can be true: Prospects can have need for your value and it can just not be the right time. The value you offer isn’t a priority today. It can be circumstantial in that maybe they really are there to see their kid play soccer. It can be seasonal in that it’s the fourth quarter, they’re behind in revenue, and your product or service won’t fix it now. Many things can make right now the wrong time. The good news—people still make business decisions for personal reasons. Salespeople must recognize this and use the time to connect on a relational level. It pays off later. 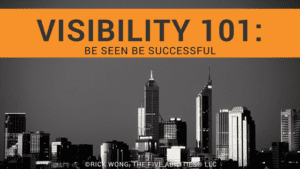 VISABILITY – Being seen in the right way, by the right people, at the right time. The prospecting troika.